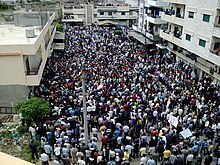 Demonstration in Homs against the Syrian Government (18 April 2011). a During the civil uprising in the first half of 2011, the Syrian opposition used the same flag of Syria as the Syrian government. The uprising was marked by massive anti-government opposition demonstrations against the Ba'athist government led by Bashar al-Assad, meeting with police and military violence, massive arrests and brutal crackdown, resulting in hundreds of casualties and thousands of wounded. Despite Bashar al-Assad's attempts to stop the protests with massive crackdown and use of censorship on one hand and concessions on the other, by the end of April, it became clear the situation was getting out of his control and his government deployed numerous troops on the ground. The civil uprising phase created the platform for emergence of militant opposition movements and massive defections from the Syrian Army, which gradually transformed the conflict from a civil uprising to an armed rebellion, and later a full-scale civil war. The rebel Free Syrian Army was created on July 29 2011, marking the transition into armed insurgency. Before the uprising in Syria began in mid-March 2011, protests were relatively modest, considering the wave of unrest that was spreading across the Arab world. Syria, until March 2011, for decades had remained superficially tranquil, largely due to fear among the people of the secret police arresting critical citizens. Factors contributing to social unrest in Syria include socioeconomic stressors dating back to conflicts in Iraq as well as the most intense drought ever recorded in the region. Minor protests calling for government reforms began in January, and continued into March. Unrelenting protests were occurring in Cairo against Egyptian President Hosni Mubarak, and in Syria on 3 February via the websites Facebook and Twitter, a "Day of Rage" was called for by activists against the government of Bashar al-Assad to be held on Friday, 4 February. This did not result in protests. Yet it is said that on the night of Mubarak's February 11 downfall, the graffiti was seen under a Damascus bridge, "Now it's your turn, Doctor"– in reference to President al-Assad, an eye doctor by training. Demonstration in Douma, a Damascus suburb, against the Assad government on 8 April 2011. Major unrest began on 15 March in Damascus and Aleppo, yet in the southern city of Daraa, sometimes called the "Cradle of the Revolution", protests had been triggered on 6 March by the incarceration and torture of 15 young students from prominent families who were arrested for writing anti-government graffiti in the city, reading: "الشعب يريد إسقاط النظام" – ("The people want the fall of the regime") – a trademark slogan of the Arab Spring. A 13-year-old boy, Hamza al-Khateeb, was tortured and killed. The government claimed that the boys weren't attacked, and that Qatar incited the majority of the protests. Writer and analyst Louai al-Hussein, referencing the Arab Spring ongoing at that time, wrote that "Syria is now on the map of countries in the region with an uprising". Demonstrators clashed with local police, and confrontations escalated on 18 March after Friday prayers. Security forces attacked protesters gathered at the Omari Mosque using water cannons and tear gas, followed by live fire, killing four. On 20 March, a mob burned down the Ba'ath Party headquarters and other public buildings. Security forces quickly responded, firing live ammunition at crowds, and attacking the focal points of the demonstrations. The two-day assault resulted in the deaths of seven police officers and fifteen protesters. On 25 March, mass protests spread nationwide, as demonstrators emerged after Friday prayers. At least 20 protesters were reportedly killed by security forces. 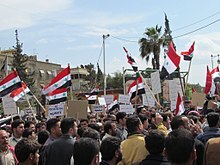 Protests subsequently spread to other Syrian cities, including Homs, Hama, Baniyas, Jasim, Aleppo, Damascus and Latakia. Over 70 protesters in total were reported killed. Police and security forces responded to the protests violently, using water cannons and tear gas as well as physically beating protesters and firing live ammunition. As the unrest continued, the Syrian government began launching major military operations to suppress resistance, signaling a new phase in the uprising. On 25 April, Daraa, which had become a focal point of the uprising, was one of the first cities to be besieged by the Syrian Army. An estimated hundreds to 6,000 soldiers were deployed, firing live ammunition at demonstrators and searching house to house for protesters, arresting hundreds. Tanks were used for the first time against demonstrators, and snipers took positions on the rooftops of mosques. Mosques used as headquarters for demonstrators and organizers were especially targeted. Security forces began shutting off water, power and phone lines, and confiscating flour and food. Clashes between the army and opposition forces, which included armed protesters and defected soldiers, led to the death of hundreds. By 5 May, most of the protests had been suppressed, and the military began pulling out of Daraa, with some troops remaining to keep the situation under control. On 29 July, a group of defected officers announced the formation of the Free Syrian Army (FSA). Composed of defected Syrian Armed Forces personnel, the rebel army seeks to remove Bashar al-Assad and his government from power. On 23 August, the Syrian National Council was formed as a political counterpart to the FSA. ^ Oliver, Christin (26 October 2010). "Corruption Index 2010: The Most Corrupt Countries in the World – Global Development". The Guardian. London. Retrieved 10 April 2011. ^ Zafar, Saad (24 March 2011). "The Assad Poison". AllVoices. Archived from the original on 11 May 2011. Retrieved 20 April 2011. ^ Mroue, Bassem (2011-06-18). "Bashar Assad Resignation Called For By Syria Sit-In Activists". The Huffington Post. Archived from the original on 2016-03-03. Retrieved 2017-02-09. ^ Oweis, Khaled; al-Khalidi, Suleiman (2011-04-08). "Pro-democracy protests sweep Syria, 22 killed". Reuters. Retrieved 2011-08-08. ^ Colvin, Mark (2011-03-25). "Syrian protestors want a regime change". ABC News. Retrieved 2011-03-05. ^ McShane, Larry (2011-03-25). "Violence erupts in Syria, Jordan; anti-government protestors shot, stoned". New York Daily News. Retrieved 2011-03-25. ^ "Syria to lift decades-old emergency law". Al Jazeera. 2011-04-19. Retrieved 2011-04-25. ^ Oweis, Khaled (2011-04-29). "Muslim Brotherhood endorses Syria protests". Reuters. Retrieved 2017-02-10. ^ Cooper (2015), p. 21. ^ "Syria: 'four dead' in rare demonstrations". The Telegraph. 2011-03-18. Retrieved 2011-03-18. ^ "Syrian general: Hundreds of soldiers, police killed by armed gangs". CNN. 2011-06-27. Retrieved 2011-06-26. ^ "Syria opposition reaches out to army". The Jordan Times. 2011-05-27. Retrieved 2011-05-27. ^ Story, AP. "Syrian troops detain dozens, 3 killed in north". ^ "As Syria flares, some U.N.'ers take flight". CNN. 18 August 2011. Retrieved 17 August 2011. ^ "Syria army kills at least 27 in overnight attacks on three main cities". Haaretz. 2011-08-11. Retrieved 2011-08-11. ^ "Syria: 24 Civilians Killed In Tank Attack". Archived from the original on 20 June 2013. Retrieved 31 July 2011. ^ "Almost 3,000 missing in Syria crackdown, NGO says". NOW News. 2011-07-28. Retrieved 2017-02-10. ^ Anthony Shadid (30 June 2011). "Coalition of Factions From the Streets Fuels a New Opposition in Syria". The New York Times. ^ Yacoub Oweis, Khaled (2011-03-22). "Fear barrier crumbles in Syrian "kingdom of silence"". Reuters. Retrieved 2017-02-10. ^ Fountain, Henry (2015-03-02). "Researchers Link Syrian Conflict to a Drought Made Worse by Climate Change". The New York Times. ISSN 0362-4331. Retrieved 2017-04-23. ^ "'Day of Rage' Protest Urged in Syria". MSNBC. 2011-02-03. Retrieved 3 February 2011. ^ Levinson, Charles; Coker, Margaret; Cairo, Matt Bradley in; Entous, Adam; Washington, Jonathan Weisman in (2011-02-12). "Fall of Mubarak Shakes Middle East". The Wall Street Journal. ISSN 0099-9660. Retrieved 2017-02-10. ^ al-khouy, Firas (2011-10-06). "Graffiti Wars and Syria's Spray Man". Al Akhbar English. Retrieved 2017-02-10. ^ "Mid-East unrest: Syrian protests in Damascus and Aleppo". BBC News. 2011-03-15. Retrieved 2013-03-15. ^ Fahim, Kareem; Saad, Hwaida (2013-02-08). "A Faceless Teenage Refugee Who Helped Ignite Syria's War". The New York Times. ISSN 0362-4331. Retrieved 2017-02-10. ^ Macleod, Hugh (2011-04-23). "Syria: How it all began". Public Radio International. Retrieved 2016-02-17. ^ Sinjab, Lina (2011-03-19). "Middle East unrest: Silence broken in Syria". BBC News. Retrieved 2017-02-10. ^ Flamand, Hugh Macleod and Annasofie. "Tortured and killed: Hamza al-Khateeb, age 13". Al Jazeera. ^ "President Assad's interview with SBS NEWS AUSTRALIA". Retrieved 2018-04-22 – via YouTube. ^ "We've Never Seen Such Horror". Human Rights Watch. 2011-06-01. Retrieved 2016-02-17. ^ "Officers Fire on Crowd as Syrian Protests Grow". The New York Times. 2011-03-20. ISSN 0362-4331. Retrieved 2017-02-10. ^ Iddon, Paul (2012-07-30). "A recap of the Syrian crisis to date". Digital Journal. Retrieved 2012-08-03. ^ Slackman, Michael (2011-03-25). "Syrian Troops Open Fire on Protesters in Several Cities". The New York Times. ISSN 0362-4331. Retrieved 2013-01-28. ^ "Arrest of leader of the Islamic Democratic movement in Syria". Elaph (in Arabic). Retrieved 12 February 2011. ^ "Jailed prominent Syrian opposition for seven and a half years". Free Syria (in Arabic). 2011-01-25. Archived from the original on 2011-05-11. Retrieved 2011-02-12. ^ "Syrian authorities detain national identity Adnan Mustafa Abu Ammar". Free Syria (in Arabic). 2011-01-28. Archived from the original on 2011-05-11. Retrieved 2011-02-12. ^ "Police Kill 6 Protesters in Syria". The New York Times. 2011-03-18. ISSN 0362-4331. Retrieved 2012-08-03. ^ "Beyond Arms, Syria Uses Arrests Against Uprising". The New York Times. 2012-06-27. ISSN 0362-4331. Retrieved 2012-08-03. ^ "Syria: Torture Centers Revealed". Human Rights Watch. 2012-07-03. Retrieved 2012-08-02. ^ "Opposition: 127 dead as Syrian forces target civilians". CNN. 2012-04-07. Retrieved 2012-09-23. ^ Oweis, Khaled (22 April 2011). "Almost 90 dead in Syria's bloodiest day of unrest". Reuters. Retrieved 22 April 2011. ^ al-Khalidi, Suleiman (2011-03-19). "Syrian mourners call for revolt, forces fire tear gas". Reuters. Retrieved 2011-03-19. ^ "President al-Assad Issues Decree on Discharging Governor of Daraa from His Post". Syrian Arab News Agency. 2011-03-24. Archived from the original on 2012-01-17. Retrieved 2012-02-22. ^ "In Syrian flashpoint town, more deaths reported". CNN. 25 March 2011. Retrieved 25 March 2011. ^ al-Hatem, Fadwa (2011-05-31). "Syrians are tired of Assad's 'reforms'". The Guardian. ISSN 0261-3077. Retrieved 2013-06-08. ^ "Syria lifts niqab ban, shuts casino, in nod to Sunnis". Reuters. 2011-04-06. Retrieved 2017-02-09. ^ "Stateless Kurds in Syria granted citizenship". CNN. 2011-04-07. Archived from the original on 2015-01-28. Retrieved 2011-11-13. ^ Hassan, Nidaa; Borger, Julian (2011-07-10). "Syrian 'national dialogue' conference boycotted by angry opposition". The Guardian. ISSN 0261-3077. Retrieved 2017-02-10. ^ "Syria opens 'national dialogue' with opposition". BBC News. 2011-07-10. Retrieved 2017-02-10. ^ Oweis, Khaled Yacoub; Karouny, Mariam; al-Khalidi, Suleiman; Aboudi, Sami (21 April 2011). "Syria's Assad ends state of emergency". Beirut, Amman, Cairo. Reuters. Retrieved 21 April 2011. ^ Macfarquhar, Neil; Stack, Liam (2011-04-01). "In Syria, Thousands Protest, Facing Violence, Residents Say". The New York Times. ISSN 0362-4331. Retrieved 2012-09-20. ^ a b Shadid, Anthony (2011-04-25). "Syria Escalates Crackdown as Tanks Go to Restive City". The New York Times. ISSN 0362-4331. Retrieved 2011-04-26. ^ "Civilian killings in Syrian demonstrations rises to 800". The Jerusalemn Post. 2011-07-05. Retrieved 2012-04-11. ^ "Syrian army tanks 'moving towards Hama'". BBC News. 2011-05-05. Retrieved 2012-01-20. ^ Abdelaziz, Salma (2011-05-15). "Shallow grave yields several bodies in Syrian city marked by unrest". CNN. Retrieved 2011-05-17. ^ "Syria death toll 'surpasses 1,000'". Al Jazeera. 2011-05-24. Retrieved 2017-02-09. ^ "Interactive: Tracking Syria's defections". Al Jazeera. Retrieved 29 September 2013. ^ Dagher, Sam; Gauthier-Villars, David (2012-07-06). "In Paris, Diplomats Cheer Syria General's Defection". The Wall Street Journal. ISSN 0099-9660. Archived from the original on 2015-02-21. Retrieved 2012-06-07. ^ "Syrian forces take over northwestern town of Maaret al-Numan". Associated Press. 2011-06-17. Retrieved 2017-02-09 – via Haaretz. ^ "Syria unrest: Protests in Aleppo as troops comb border". BBC News. 2011-06-30. Retrieved 2012-01-20. ^ "Syria: 'Hundreds of thousands' join anti-Assad protests". BBC News. 2011-07-01. Retrieved 2011-08-03. ^ "In Damascus, Amid Uprising, Syrians Act Like Nothing's Amiss". The New York Times. 2011-09-05. ISSN 0362-4331. Retrieved 2017-02-10. ^ "Syria: What motivates an Assad supporter?". Global Post. 2011-06-24. Retrieved 2012-02-22.